Petit Chat is having a new tunic shirt for the Marvelous Event so Kitty is going to show you the nice shirt named "Holidays"! The first thing you will notice about the shirt is how smooth and detail it is. That is one of the feature of the Mesh tunic. 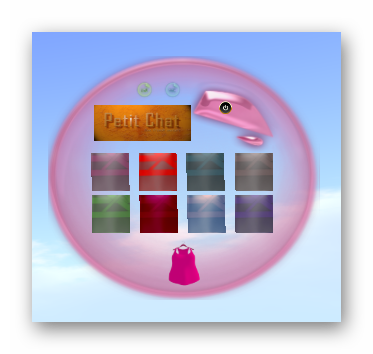 But that is not all, the shirt comes in 3 different colors and it is selectable from the included HUD! As you can see, the HUD is simple and easy to use and there is a easy hide button which hides the HUD from view. The Holidays shirt comes in different sizes from XXS to L and of course fitted is included too with the alphas. There is also a combined alpha if you are wearing the Holidays Pants as well! As you can see, the Holidays shirt is pretty and has a great great effect under the right light too for photos. It is good for all the casual moments where you can spend your time this holiday without pressure. This is featured at the Marvelous Monthly event.